Prominent & Leading Manufacturer from Jalandhar, we offer laminated safety glass. It consists of two layers of glass with a layer of film, called the interlayer, in between them.The glass panes can be basic float glass or tempered/toughened or heat strengthened glasses. If the glass is broken fragments tend to adhere to the PVB interlayer thereby reducing the risk of injury from falling glass. The interlayers in laminated glass have the capacity to absorb the energy of impact and resist penetration. Laminated glass provides durability, high-performance and multi-functional benefits and at the same time preserves the aesthetic appearance of glass. Laminated glass provides a solution to many architectural design problems and offers increased protection from the effects of disasters such as hurricane, earth quake and bomb blasts, if suitably designed. Features of Laminated Glass:SAFETY:Ordinary glass windows are brittle and break into long sharp pieces, causing serious and sometimes fatal injuries. An important feature of laminated glass is its performance under impact. That is, the interlayers in laminated glass have the capacity to absorb the energy of impact and resist penetration. Safety hazards caused due to breakages are minimized with the use of laminated glass. Although the glass may break, the glass fragments will adhere to the plastic interlayer, minimizing the risk of injury and property damage. SECURITY:Burglars often break windows to get to door and window handles, but laminated glass can resist the intrusion because it is virtually impossible to cut through the thick PVB layers even if the glass gets broken. Contact an expert to design suitable laminated glass for intrusion resistance. SOUND CONTROL:Laminated glass has proven to be an excellent barrier to noise. 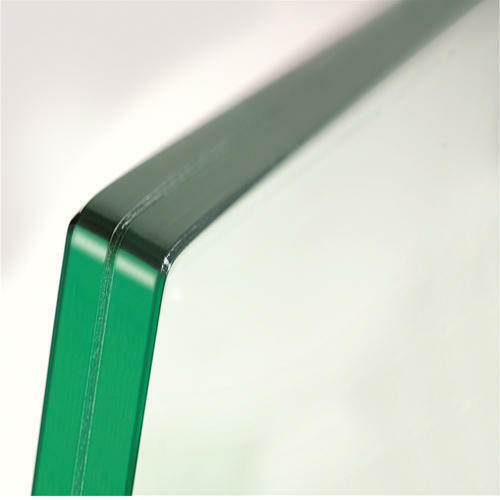 Shear damping performance of the PVB makes laminated glass an effective sound control product. This sound dampening is due to the low elastic property of the PVB interlayer. WEATHER AND DISASTER CONTROL:Laminated glass helps provide protection from injury and property damage caused by glass breaking because of natural disasters such as hurricane and earthquake. It does so by keeping the glass intact within the glass frame. DURABILITY:Laminated glass is exceptionally durable, maintaining its colour and strength. It can be used for a variety of architectural and interior design applications such as floor glazing, stairs, balconies, balustrades, internal panelling and exterior cladding as well as for the more traditional doors and windows. DESIGN VERSATILITY AND INSTALLATION EASE;Laminated glasses can be manufactured flat or curved. They can include annealed, toughened, heat-strengthened, wired, patterned, tinted or reflective glasses. Interlayers can be used to add colour tints and for further aesthetic and privacy needs. Laminated glass is simple to install. If the glass is not heat treated, it can also be cut, drilled or notched. LOW VISUAL DISTORTION:Distortion is caused by “roller waves” in tempered and heat-strengthened glass. This can be avoided by using laminated annealed glass. Sharp reflected images are possible with curtain walls constructed of laminated annealed glass. Applications of Laminated Glass:Laminated glass is widely used in manufacturing and automotive industries and in a variety of commercial and residential applications because of its safety, security, sound abatement and solar control characteristics. In glass skylights, sunspaces, sloped glazing installations and curtain walls, there is always the possibility of glass breakage. This is why many building codes worldwide use laminated glass for overhead glazing. It is used in schools, hospitals, hotels and office buildings, and wherever there are sound control requirements. Looking for “Laminated Safety Glass”?